There are plenty of Prescott mountain biking options available to biking enthusiasts visiting the area. And if you didn’t bring your bike, you can always rent one! One of the areas oldest bike shops, Prescott Valley Bike Works offers bicycles and bicycle parts, all with exceptional customer service. Offers Mountain Bike rentals, repairs, tours and skills classes. Let us help you have the best vacation in beautiful Prescott, Arizona. The Acker Park Trail is a trail of moderate length located in downtown Prescott. Granite Creek Trail is a short, leisure tail, great for the kids and burning a little energy. 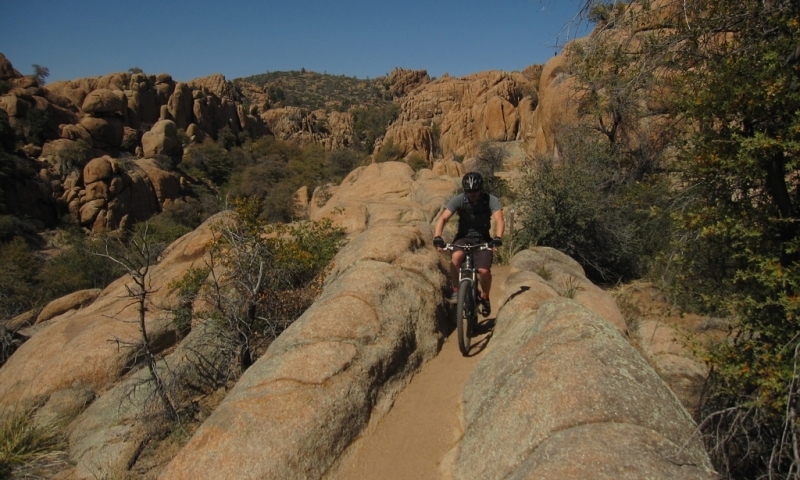 The Pioneer Park Trail is a 9 mile long combination of several Prescott bike trails. Where can I go bike riding? A multi-use trail close to downtown Prescott. Trailhead: The trail begins at 421 S Virginia Street, right in the downtown area. A walking and biking trail exists around the park and connects to the Greenways Trails. Trailhead: Enjoy the short cruise around the park. This system of trails is situated across from Commerce Drive from the Pioneer Park ball field complex. Trailhead: There are multiple trailheads for this system of trails. Park at the ball fields and hop on at any point. Follow the multiple colored markers to keep yourself on track.